SWDT have created and contributed to community and fundraising events that have heightened visibility and awareness and cumulatively raised thousands of pounds over the years. Groups supported include Wallace and Gromit Cots for Tots, Shelter, Muscular Dystrophy, the Haiti fund, Cancer Research, the Westway and Oscar (Association for Sickle Cell and Thalassaemia). SWDT contributed to various charity and community events over the year including a 30 minute set to the Sue Ryder Garden Gala in June - a great event that raised just under £9000. This Autumn's feature performance at the Bierkeller will also be used to raise donations and awareness for Shelter, and keep an eye out for our 'Round the World in 80 minutes' fundraiser for Shelter at the Trinity on Sunday 23rd November. A huge thanks to IOP Publishing for helping sponsor the venue hire costs. SWDT have teamed up with the Creative Youth Network to create a youth led contemporary ballet company - SWDT Cygnets. Once again we are hugely grateful to IOP Publishing who have sponsored 25 tickets to our event The Dance of the Grimm Heroine so that we can give them away to local charities for distribution to treat those dealing with various challenges and who may not usually get the chance to go to the theatre. Barnardos and the Bristol Association of Down Syndrome Support have already leapt at the opportunity to take up some of these sponsored tickets. IOP Publishing sponsored tickets for SWDT's From Bristol to Broadway at Colston Hall2. The tickets were made available to local community groups free of charge to give wider access to arts and culture in the city. Community groups in the scheme included the Down Syndrome Association, Bristol and Full Circle. Many, many thanks to IOP Publishing for their support. SWDT secured funding to hold a series of dance workshops mixing ballet with other contemporary dance forms and physical arts for children and young adults in Bristol free of charge. The workshops followed From Bristol to Broadway, breaking down some of the dance styles in the show. A lot of people may not have had the opportunity to find out how much they can get out of ballet classes - our workshops set out to change that! 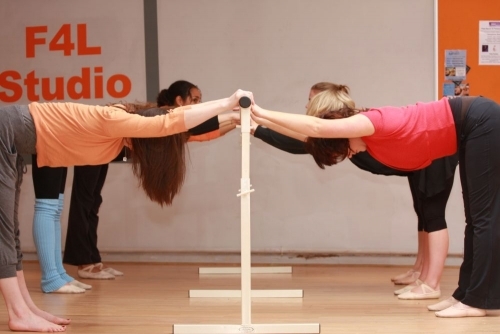 SWDT has been hosting classes in ballet and contemporary available to the general public. This summer we teamed up with India Dance Wales to host sessions in classical Indian dance and classical ballet.